Background vocals are fun, but they can be frustrating at times: so many tracks, so little time. 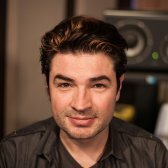 Before actually mixing them, part of the professional sound you've heard in countless records is achieved by having a solid method in preparing them. Your workflow and approach will be key to being able to shape them the best way for your tracks. In this video, Fab unveils his method to keep things under control when your song is empowered by some beautiful (and no longer dangerous) background vocals. Good morning children, today we're going to prepare our vocal tracks for mixing. What is it that we could possibly do to the vocal tracks that hasn't been done by the time it's ready for mixing? Good question. I wanna show you. I think this is very important because vocals are the most important part of the modern record making process. Except maybe for some of those instrumental records. So here's a fantastic session from the no less fantastic Banda Magda record that I just finished mixing and co-producing. There's a lot of vocals. You know you have a lot of vocals when not all vocal tracks fit in Pro Tools with the small fader mode on. And we have somewhere like 50, 58 tracks of vocals at this point. But they're necessary, this is Magda's vision so we shall respect that. By the way, I erased all other tracks out of the session except for the bass so we have a pitch reference. This was 160 tracks total and that would not be practical for this video. So here's what it sounds like, it's called El Pescador. These are the raw vocals I got. Obviously there's a lot of stuff going on. The idea here is to prep the terrain so that you don't end up dealing with 50 tracks. You gotta break it down and you gotta put little pockets and little drawers so you can think of it straight. Let's look for the lead, usually it's the left most track in my sessions when I produce. Alright, I wanna color scheme this. The bass right here we use for reference so I'm not gonna color scheme it. For this video I'm just gonna keep it black. Lead vocals red. Remember? Is there another lead vocal? Let me zoom it a little bit. No, it seems that's the only vocal that sings all the way through. What's this? So, there's a group leftover from production. If they were no group I would listen to every single track, figure out what it is and see if it fits in the group and make a group for it. Now I can deal with this four together. With 50 tracks of background vocals, look at all these groups, let's see. What is the group that works here? This one is called 'Magda 1st 4', that must be it. What's this? What's this? That's a different part? I know I can give a color to these four because they belong together. OK, that's a low part. Let's see I have a group. 'SECOND 4'. distinction here. What's this? Nothing, let's go back here. There's a big void here. What happened in here? We have four kind of a drone, steady pedal thing going. That's the bottom of the pedal, the second note and the eight of them together sound like this. happy, let's see if I already have a group for these. All of them all together. I don't like that. I'm gonna get rid of this. What was I thinking? I'm gonna make a group for this. I'm gonna call it 'Magda Pedal HI'. I'm gonna call that 'Magda Pedal Low'. What else we get? It's a bunch of 'Gringos'. I think I'm gonna create a group of these and call it 'Gringos 1'. And then give it a Gringos' color. And this, just plays here. When you have 50, 30 or even 20 tracks of vocals, within the context of a 80 or 100 tracks mix, it's really nice to be able to isolate one part by just going 'click' as opposed to having to figure out what's going on. The bird's eye view is key, specially if you wanna mix more than one song a week, or one song a year. What's this? That's more of a lead vibe. How about this one? Nothing. This is kind of the tone, I'm gonna call it 'Gringos 3'. This, I sense, is more of a lead kind of vibe. Nice! See, these guys sound more genuine, the others guys sound like 'Gringos'. Kind of a... Lead back. What else we get? There's more lead backs here. I'm gonna call it 'Lead back 2'. That's probably what I'm gonna use for texture. What's this? So this is kind of the same vibe as that top one there. So we should move it closer to that top one so that when we look for a sound, this kind of marries together. And I'll call it 'Ospinas'. And give it a color. Anybody sleepy yet? Stay with me. Stay with me! What is this? Oh, Ospinas is back. Cool. How's this? That's a nice harmony. We're gonna call it 'Harmony'. various groups of background vocals and figure out who does what without having to work too hard. What's this? As you can see now, this is a lot clearer. What would be the next step? My next step would be to listen to the lead vocal and figure out if it's consistent from A to Z. You can see here it grows. Here's a different kind of vibe and tone. In some songs, you have the verse that feels one way and the chorus that feels another or sound another. It's really difficult to manage those two things. Don't duplicate the playlist, don't duplicate the alternate playlist. And then cut the part that sounds different or will sound different and put it in the other track. So now, when you have your plug-ins, you can have all the same plug-ins but you can have slightly different settings between track A and track B. Separating the same vocal in different tracks is a great way to either A: Have a different sound for a different part of the song without having to automate. Have two different sounding sources matched but behave the same within the context of the track. And I usually try to avoid the spelling mistakes. And that Lead bus goes to my main output. Why do I do that? Because, hold on, let me make sure that you can hear it too. The reason why I do that is so that, even tough this is the verse and this is the chorus, I have one fader for the entire vocal. So if I wanna trim up or trim down the vocal for the entire song I can move this fader, I don't have to move either of these two faders together or try and group them and complicate things. Also, it gives the opportunity to do processing on both at the same time. So if there's something that I know I want on both tracks, for example, a little tape machine at the end, like the Studer, like this, I know that I can choose the Studer. So many plug-ins, so little time. There you go. Now the Studer is applied to both my tracks. The verse and the chorus. In this particular song, the quiet and the louder part. Don't forget to solo safe this two tracks so that when you wanna solo the vocal no matter where in the song it solos on the sub. Another thing that it's good to set up right now is anything that you know you're gonna use on vocals for effects. For example, I usually have a delay. And a reverb or two. You could import this if you're a template kind of guy. I tend to do it from scratch every time because it forces me to try something new as opposed to just import the same thing every music for the last two years which is boring as hell. So let's call it 'quarter delay'. And don't forget to solo safe whatever tracks you send. If you've been watching our videos you know that FX are yellow. So now I have a delay for both these things. I can do this with the reverb too. I usually have a Plate reverb, a Hall reverb, a short office style reverb, a quarter delay and an eight note delay on my lead vocal, dedicated to my lead vocal. That doesn't mean I'm gonna use all of it. Unless of course I'm mixing an Enya record but I'm not so I'm probably not. But they are there, which means when I'm in the flow of mixing everything is preset and I don't have to think about routing and stuff like that. So let me quickly do that for you so you can see it, fast forward. Et voilà! That was a phenomenal amount of fun, let's do that again sometimes. Maybe you're right if you're using templates. I tend to use the color scheme to spatialize myself within my session. I know that my red is gonna be my lead vocal and I know that whatever is gray is a bus or a sub. I put the bus next to the 2 red tracks and now I know that these 2 tracks are going to that sub. I also use my FX in yellow as a boundary between groups and instruments. If you look in the time-line you can see how it sticks out. Now you know you have the vocal in red, you have a second track of vocal, which means you're gonna have 2 different sounds. The Sub and then 5 tracks of effects. Now that I have the 5 tracks of effects here I know that the next track is not the lead vocal, it's something else. Plus, it's orange so I know it's a background vocal. In this particular case, what I'm gonna do to make this manageable because it's an insane amount of tracks, I'm gonna subgroup a bunch of stuff. How do I choose to subgroup? That's a musical decision. That's a lot of energy, maybe I'll group that with something else. And then send that so you can hear it. In this particular case, because I wanna be able to keep control of listening to this versus this, and do a balance between the two, I'm not gonna solo safe the source tracks, I'm gonna solo safe the Sub. Makes sense? If I had solo safed the source tracks, I couldn't make the difference between my two groups. It would be a problem. Same thing, so I'm gonna do that. And I'm gonna solo safe that. It's better if I send it to the output so you can hear it. Now I can balance between the two of them and I can balance this one against this one, very easily, by doing this. She should do this for a living. How about this one? That's more a harmony. I'm gonna make one sub of the first two. And one sub of the next one. Let's call it 'Gringos Bus'. And then, one of these. These are my lead guys, which I'm gonna keep together. Remember them? I'll play that for you. That's clearly a different vibe. These are gonna stay together. And here, the last ones. Now we have clearly organized our session. At this point it's a good idea to set up the effects for the background vocals. And apply those effects to only those subs. And that way you don't have to deal with 50 tracks anymore. So, create one. I usually have some sort of pitch effects. I deselect that, otherwise it's gonna apply the effect to itself. And then, probably, Back Plate. But, it depends on the music. And I made a mistake I said not to make. And then, sometimes, some back sound effects. These are my background effects. They all go to the main output which on my rig is D 15 and 16 for complicated reasons that we will not cover here. And don't forget to solo safe your effects. We went from a bunch of tracks to a system. Check this out, here's an interesting benefit. What you could do at this point is hide most of these tracks, like this. Just keep the ones that give you presence because it's nice to have a visual presence of what's going on. Sometimes it's difficult to do, in this case we'll manage, like this. Actually, this is a good one. It doesn't really matter which one you leave visible. We're gonna hide everything that we don't really need to see. And that's gonna give us some amazing screen real estate change. I'm selecting every track that I feel I don't need to look at. Now that everything is selected I can hide all those extraneous tracks, they will still play. And I still have control over the control of the entire groups. Right here. So I can level the entire groups and I can use these tracks as a visual to where they play so I wanna know what's going on here. That way I have a visual and I have audio control over the whole group. But I don't have to look at those 50 tracks, it's gonna compact my session a lot allowing me to move a lot faster. If you need to do particular processing to discrete tracks within the group you just have to show them again, it's not a big deal. Here they are, you do your processing and then you hide them again. The idea is to have as few tracks on the screen as possible so you can concentrate on the music, not on the visuals. 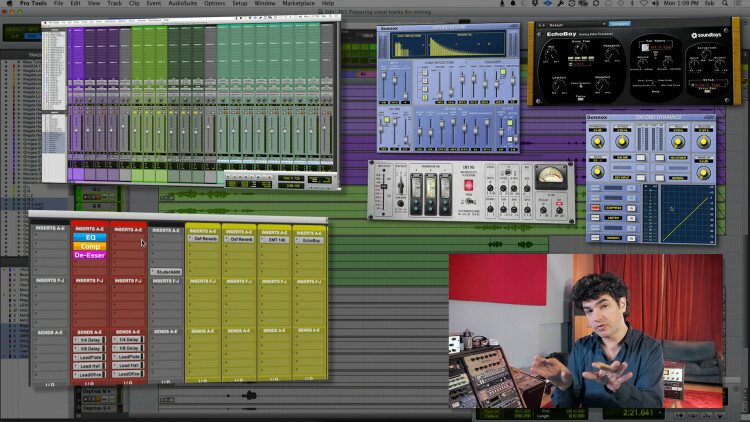 Other important considerations when preparing your vocal tracks for mixing. Where you put you plug-ins? It's very important. I always put my EQ on insert 2 or 3. I tend to start with the EQ, that's my personal taste. Your taste will vary. However, I strongly recommend you leave the first insert opened. Why? Our OCD sense of order says start at the top. But turn that off for a second and think. If you have an EQ up here on the first insert, If you wanna tune it, since you have to put tuning first, my recommendation, then you're gonna have to move all this plug-ins you would have here down at least one slot or two to make room for the tuning plug-in. Let's keep that, maybe two. You are finally planning ahead just like you mother wanted you to. Then you could put your compressor right here. I'll put the Oxford today. And then you can copy to your other track so at least your basic settings are the same. The same goes for background vocals. And for effects and everything. Make sure you leave yourself the room to pre-process if you need to. Consequently, what I just did here is awful. I have all my reverbs on the first insert. What happens if I wanna hi-pass the send to the reverb? I can't right now, I would have to move it. A couple more tricks that are important. If you're gonna do parallel compression on vocals, what should you make? Because you have two tracks going into a bus, all you have to do is duplicate that bus, right? If you duplicate that bus, now you have twice the same bus being fed from the same stuff all you have to do is put your insane compressor right here. Let's pick one that's really insane like this dude. Now you have parallel compression on both leads through one fader, as opposed to have a send, or duplicate the track and more complication, you don't want more complication. You want control and simplicity. This is a good way to set the parallel compression on vocals on such a big session. You just duplicate the sub. This process may be a tiny bit pedestrian. It's less fun than setting a compressor up, maybe. It's the music equivalent of doing your taxes. And just like your taxes, if you don't do your taxes, somebody will come and find you. Great organization video! Love it when you get a session with more than 100 tracks. Instead of kicking and screaming, keep cool and organize:) Thanks for the tips! Ben, after looking at the menus I still can't find this command. HD only ? I'm using non-HD version of PT. tnx. @Gary - At the bottom of the "assign track output" menu there's an option to create a "new track" that makes the aux, maps the input/output and names it all in one step, no secret commands necessary. Fab, one small spot you take a set of tracks, create an aux, map the tracks to the bus, looks like all in one step. Could you please tell about the command sequence that does this (versus create the aux, choose a bus, name it, map the tracks to the bus, etc.)? tnx. This was really great. Lots of very sensible, useful tips and strategies. I would love to actually see how the vocal bus was doubled for parallel compression, including input and output designations. That part actually raised more questions than it answered. :) Since I use Logic 9, I can't simply duplicate an Aux - but I could, for example, use AUX 8 and AUX 9, and "mult" Bus 5 to feed both. Thanks again — much appreciated! Sooo many great tips here! Thanks.